PowerPoint is a professional presentation tool. However, it can be a little difficult to actually figure out how to insert PDF into PowerPoint. However, there are a few methods that you can use in order to obtain the PDF content you need and insert it in a professional presentation. You can do this by displaying the PDF content on a slide, or you can add the PDF file as a professional support document that can be seen during the presentation. Below we will show you how to insert PDF file content into a PowerPoint with PDFelement ProPDFelement Pro. With PDFelement ProPDFelement Pro (Compatible with macOS 10.14 and Windows), you can fully manage your PDF files. This professional PDF editor and converter helps you to convert PDF to PowerPoint, Word and many other file formats easily without losing the original layout. You can follow the simple steps below to convert PDF to PowerPoint or add PDF to PowerPoint. Step 1. Import the PDF file into the PDF editor. Step 2. Click on the "Convert" button and select PowerPoint as the output format. Step 3. Click on the "Convert" button to start the conversion. Step 4. Add the converted PDF content into your PowerPoint. Easily edit PDF text, graphics, images, links, watermarks, etc. 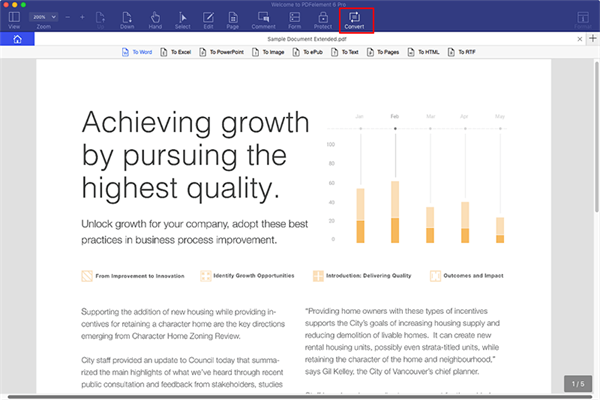 The advanced OCR feature enables you to convert and edit scanned PDFs with ease. Batch convert PDF to other popular file formats and add wartermarks etc. Create PDFs from other formats and create PDF forms easily. Easily mark up and annotate PDF files with multiple markup tools. Combine multiple files into PDF and split PDF into several files. This method is a bit of a workaround, but it does allow you to integrate the content quickly and with the best possible results. You will need to enter PowerPoint first, and then click on the slide that you want to add the content to. Once that is done, you need go to Insert > Images > Screenshot, and then click the Screen Clipping function that you will find under Available Windows. When you choose this option, the PowerPoint will minimize automatically and now you will be able to focus on the PDF file. At this particular time, the cursor will transform into a crosshair, so all you have to do is to drag a box around the content that you want to clip, as this will help you take a screen capture. Be aware though that if you press the Escape key at any given time, you will cancel the process and thus you will have to start again. 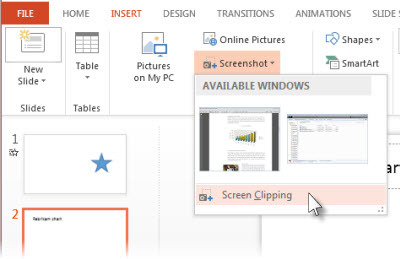 It's important to know that when you choose the Screen Clipping function you will be able to focus on the latest window only, so make sure you have your PDF open on the screen. Also, after grabbing the PDF you can resize the picture in any way you'd like. If you want to leave comments or highlight some sections in the PDF, you can click the "Markup" button and choose the options you need. You can also add links in your PDF or sign your file to protect it. 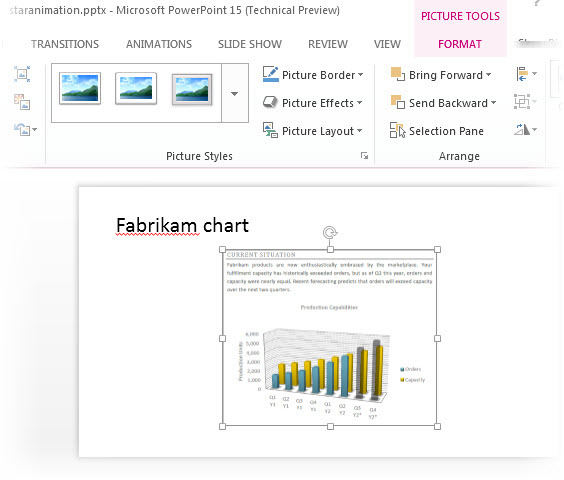 If you want to add your PDF as a support document for your slide, then you can also do so with PowerPoint. Follow these instructions to learn how to add PDF to PowerPoint quickly and easily. First, open Power Point, select the slide where you want to add your file, and then press Insert/Object. This will open a new box where you will have to select the "Create from File" option. In this particular box you need to enter the PDF location with the help of the Browse function. Locate your PDF, and then click to choose the Open function. Once this is done, you will receive an Insert Object box, which you need to click OK in order to finish. If you want to use the PDF file that you attached to the PowerPoint slide, all you need to do is to go to the slide, click the PDF icon, then click on the Links/Action function. Select the mouse click or mouse over tab, and then continue with the Object action. Lastly, you need to choose the option to "Activate Contents in the List". 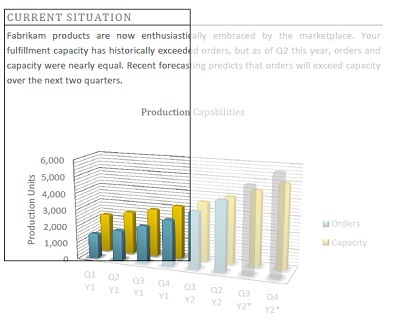 With the help of PowerPoint you can easily integrate your desired PDF content into any presentation. There are multiple options for adding a PDF to PowerPoint. With the help of our instructions you should now be able to obtain quick and easy results. 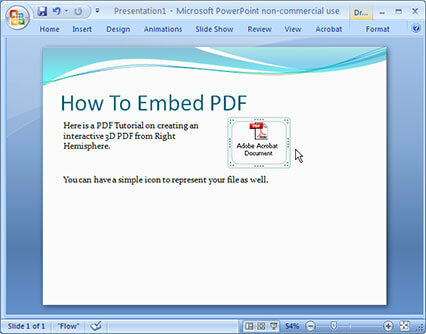 This is how easy it can be to insert PDF within your PowerPoint presentation! About | License Agreement | Terms | Privacy | Cookies Policy | Contact Us| Copyright © 2019 iSkysoft. All Rights Reserved.